Recommendations for After-market Steering Wheel? Discussion in 'General Ranchero Help' started by colnago, Nov 7, 2018. It's looking like my old steering wheel is coming to the end of its days. There's a bit of slop in the mount, but not quite at the "OMG, I'm gonna die" stage (yet). So, what opinions do folks have on good replacement brands? I've heard good and bad about Grant. What else is there that wouldn't look out of place in a near-stock '64? I'm definitely not after a modern look. Think big; I have manual steering, and the current wheel is 16" in diameter! Big might be a problem to find in aftermarket wheels. I think I would take a look for folks who restore vintage steering wheels in the Hemmings Magazine. A nicely redone Falcon wheel and horn ring might look nice. Summit sells a few of the larger wheels. By the way, are you sure the play is in the steering wheel? Because if it is then the splines on the shaft are likely ruined and a new wheel won't correct the problem. Play is usually caused by worn steering parts rather than the steering wheel itself. Aftermarket, shmaftermarket! I got an O.G. Ford one from our very own Carl, restored the center cap, and then farmed out the leather work. I believe it came out of an 80's Bronco. I still need to see what is causing the play. If I grab the wheel at 9:00 and 3:00, I can rock it front-to-back maybe 1/8". It's small enough that I can live with it for a while. I mostly wanted opinions on options out there. If it's the shaft, I guess I start hitting the junk yards. For the most part, I don't mind the manual steering. I have it in my '67 F250, and the Ranchero is no comparison! You will probably find the little ball bearing at the top of the shaft is beyond hope. Easy fix, just remember to grease the new one before replacing the steering wheel. Many of those bearings had a rubbery like spacer ring on the outside edge that acted like a cushion. It is rubber, it deteriorated over the years. 1/8" sounds about right. Stupid question, but can I replace the bearing and spacer without removing the steering shaft? While I'm asking stupid questions, what's a good reference manual for working on the old girl? I just got a Chilton's from eBay, but it's too recent and too generic to be much help. Yes. Shaft stays in place and bearing is removed by pulling it up toward the steering wheel splines. Factory Ford shop manuals are the most complete with how to and photos or drawings. I don't remember exactly but you may have to slide the turn signal switch up toward you to get at the bearing. Some models use the base of the turn signal switch as the bearing retainer, some have a snapring on the shaft holding the bearing in place. Some only have a spring that compresses when the steering wheel is tightened that holds the bearing in place. 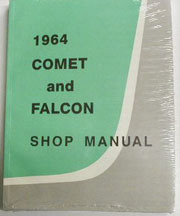 Swap meets or E-pay or search in Hemmings to find original Ford manuals, usually in a set but sometimes one big book. Sometimes you can find the manuals on a CD . Doesn't colnago have a '64? If it's near stock, it would be a generator car, and a '65 wheel is different than a '64 regarding the horn contacts. Well, the PO called it a 1964-1/2 (look, ma, I'm a Mustang), but California calls it a 1964. On the other hand, it has a 289 (installed by the PO; it came from the factory with a 260). So, it's kind of a mish-mosh, which means that I probably need to order both sets of manuals! By the way, BeerBelly, you're right; it does have a generator. Okay, 1964 and 1965 manuals ordered from RockAuto. Should be here in a week. Both manuals, delivered, for $56. RockAuto rocks! Anyway, I'll check the bearing and gasket, then shaft, then steering wheel, and go from there. I have a big Ron's steering wheel. I orginally got it for my van, but that isnt getting on the road anytime soon, so I put it on my Ranchero. Not everyone digs it, but I do. I used a Grant's adapter.